JFE Group Name and Corporate Symbol |JFE Holdings, Inc. 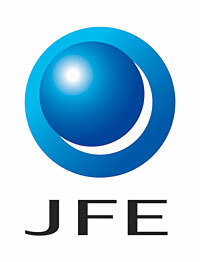 The name of the group is JFE Group. "J" is for Japan, "F" is for steel (as in Fe, the atomic symbol of iron) and "E" is for engineering. The acronym can also be thought of as standing for "Japan Future Enterprise," i.e., a future-oriented Japanese business group centered around the core businesses of steel and engineering. The continuously rotating globe represents a group that is in constant pursuit of new opportunities, actively seeking to make new contacts and to strengthen communication with its customers. The blue color denotes trust and profundity, symbolizing a global company pursuing infinite business possibilities.